Manipulation of LVAD pump speed during exercise in patients with heart failure: what are the consequences on cardiac output and peripheral blood flow? The left ventricular assist device (LVAD) is utilized as a bridge to recovery or transplantation and is now increasingly used as destination therapy in patients with advanced heart failure. Even if cardiac output and the capacity to perform exercise are comparable between pulsatile and continuous-flow LVADs, the latter is preferred because of its longer life span and its implantation is associated with lower incidence of stroke and comparable, or even improved, quality of life vs. pulsatile LVADs. Since continuous-flow LVADs do not work in an automatic mode as pulsatile LVADs, it cannot modulate cardiac output during exercise. This could become an obstacle for patients who would like to exercise (even if it is just climbing stairs). So, we decided to manipulate the continuous-flow LVAD pump speed during exercise in order to see if it could elevate cardiac output, the perfusion of the legs and the brain, and eventually enhance the capacity to perform exercise. Eight patients with end-stage heart failure provided with a continuous-flow LVAD participated to this study. They randomly performed two incremental exercise protocols (one exercise protocol was performed with the usual fixed LVAD pump speed set at rest (range: 9400 to 10 200 rpm) and the other exercise protocol was performed with increasing pump speed (400 rpm per exercise stage) on a modified cycle ergometer). During these two exercise protocols, we measured numerous variables such as cardiac output, leg blood flow (in 3 patients) and cerebral blood flow and oxygenation (well, we measured a lot more variables that I won’t refer to in this post). Of note, we did not have access to breath-by-breath gas exchange analysis so exercise capacity was measured by maximal workload and exercise time. Even if the LVAD pump speed was kept constant (open circles in the figure), cardiac output and perfusion of the legs increased significantly during strenuous cycling exercise. Cerebral perfusion, however, was rather low at rest (80% of the perfusion observed in normal individuals) and it did not increase with exercise (Brain blood flow velocity measured in the middle cerebral artery usually increases up to moderate intensity exercise. At higher exercise intensities, it levels off, at around 50-60% of maximal exercise, and then decreases during heavy exercise). A moderate increase in LVAD pump speed during exercise did not improve exercise tolerance. However, the increase in pump speed (filled circles in the figure) was associated with higher cardiac output and improved cerebral perfusion during light exercise (i.e. at an exercise intensity close to the intensity of everyday life activities). Consequently, the rather low cerebral perfusion observed in these patients increased to a small extent during exercise. A lot of research will be necessary to better understand the influence of a change in LVAD pump speed on cardiac output and organ blood flow during exercise. In light of these pilot results, our research team considers that it could be advantageous during exercise to increase the pump speed of continuous-flow LVADs or at the very least, these results support maintaining interest in improving automaticity of continous-flow LVADs! Why does phenylephrine decrease frontal lobe oxygenation but increase cerebral blood flow velocity? Hypotension represents the most frequent side effect of anesthesia. Its correction is of importance to secure perfusion pressure of vital organs such as the brain. As discussed in a previous post, I have been interested in the impact of vasopressors on cerebral blood flow and oxygenation since my postdoc. We, and others, have reported that the utilization of vasopressors increasing mean arterial pressure by peripheral vasoconstriction was associated with a reduction in frontal lobe oxygenation. We observed such results in the laboratory in normotensive healthy subjects and in the operating room in hypotension patients undergoing elective surgery. 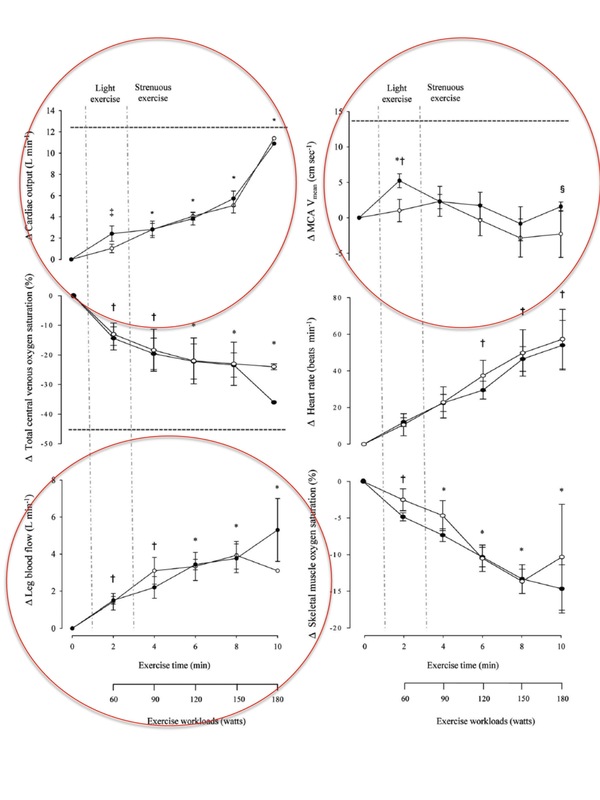 We need to better understand what explains a reduction in frontal lobe oxygenation following the utilization of vasopressors like phenylephrine or norepinephrine because 1) these agents are first-line agents used to correct mean arterial pressure in hypotensive states and 2) a reduction in cerebral oxygenation during surgeries such as a coronary artery bypass is associated with neurological impairments after the surgery and neurological outcomes seem to be improved when the reduction in cerebral oxygenation is prevented or corrected. One intriguing observation reported by Ainslie’s group as well as our research group was that bolus/infusion of phenylephrine, a selective alpha-adrenergic agent, was associated with a reduction in frontal lobe oxygenation, but also with an increase in cerebral blood flow velocity measured in the middle cerebral artery. This was intriguing because one could argue that a reduction in cerebral oxygenation is the consequence of a reduction in flow. One suggestion could be that phenylephrine induces (whether directly or indirectly via a reduction in cardiac output) vasoconstriction of the middle cerebral artery, leading to an increase in cerebral blood flow velocity (remember that we are not measuring blood flow but blood flow velocity with transcranial doppler) and a decrease in frontal lobe oxygenation. 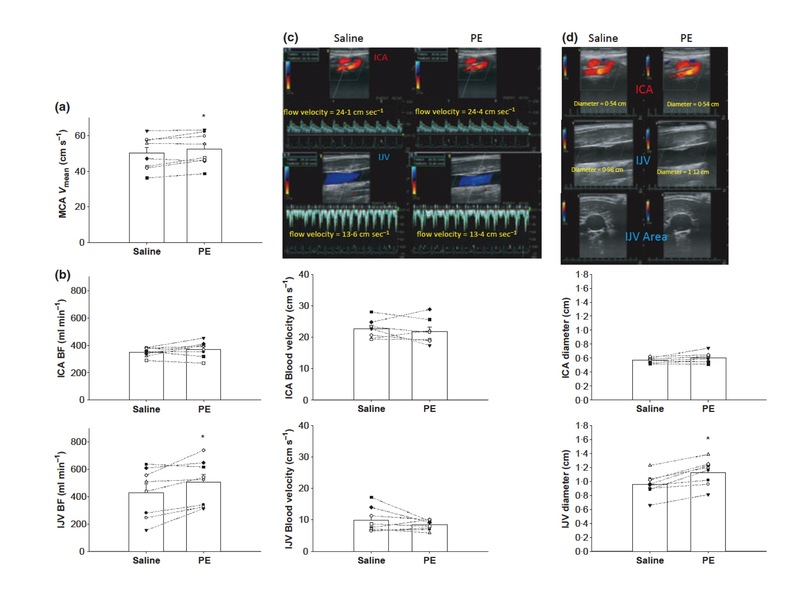 Shigehiko Ogoh’s research team investigated that issue by evaluating the influence of phenylephrine on frontal lobe oxygenation (by near-infrared spectroscopy) and middle cerebral artery flow velocity (transcranial doppler) and blood flow changes in the internal carotid artery and internal jugular vein (by duplex ultrasonography). As others did, this team observed reduced frontal lobe oxygenation (not in the figure) and increased middle cerebral artery blood flow (MCAVmean) with infusion of phenylephrine vs. saline. Interestingly, blood flow in the internal carotid artery (ICA BF) did not change and blood flow in the internal jugular vein (IJV BF) increased (due to an enlargement of internal carotid artery diameter). No change in arterial oxygen or carbon dioxide tensions was observed. However, phenylephrine did not decrease cardiac output. What was the interpretation of the authors? So phenylephrine seems to constrict the middle cerebral artery while cerebral blood flow is maintained. Although further research is needed to support such findings and explain how this agent could directly constrict this artery without crossing an intact blood brain barrier, this study suggests that the utilization of phenylephrine don’t interrupt delivery of oxygen to the brain despite the reduction observed in frontal lobe oxygenation. The authors suggest that the reduction in frontal lobe oxygenation could be related to a shift in the arterial versus venous contribution to the near-infrared signal (used to measure frontal lobe oxygenation). Indeed, an increased blood flow from the vertebral arteries (with no change in internal carotid artery blood flow) could have contributed to the higher venous blood flow during the infusion of phenylephrine. In addition, the authors suggested that we cannot exclude the influence of skin blood flow on the near-infrared signal. These results and interpretations are very interesting and definitely move the field forward. However, one needs to keep in mind that a reduction in cerebral oxygenation has been associated with neurological impairments following cardiac surgeries. I am not convinced that this could be explained by a redistribution of cerebral blood flow or a reduction in skin blood flow. One final issue I would like to discuss is the absence of impact of phenylephrine on cardiac output. We and others have reported reduced cardiac output with the administration of phenylephrine. As discussed in other posts (here and here), the potential mechanisms underlying the modulation of cerebral oxygenation by cardiac output could be sympathetically mediated vasoconstriction induced by a lowering in cardiac output or it could also depend on the distribution of circulating blood volume. So, the results from Ogoh’s group cannot be necessarily generalized to subjects experiencing a reduction in cardiac output with phenylephrine. Further research is warranted to characterize the influence of vasopressors on cerebral perfusion/oxygenation and as Ogoh’s team did, we need to measure blood flow/blood flow velocity in different arteries during infusion studies in order to have a more complete picture. The official countdown has started. We are expecting mini-physiologiste in less than a month now ! In the beginning of March, our life will definitely change! Three more grant proposals to write…two more classes to teach…a couple of manuscripts to submit…and then my priorities won’t be the same anymore!